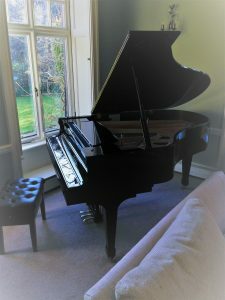 We recently shipped this lovely 20 year old Yamaha Grand piano to Dublin from Chiswick, West London to Dun Laoghaire, Co. Dublin. Our extra thick padded piano covers ensured that the piano remained totally unblemished during a rough Irish sea crossing. On delivery we carefully surveyed house entrance, hallway and doors into new piano room to ensure a seamless and damage free installation. A quick polish after assembly and we left the piano in its new home. Talk to the experts first. Give us a call any time on +353 51 307 994 or contact us. We’d be delighted to offer no obligation advice.